Painting Azek Trim - Yes or No? Should I paint the Azek trim on my house? It's a common question today. In the past exterior trim was made of wood (typically pine) that was subject to rot, insects, and maintenance painting every few years. Contractors have been specifying to homeowners and property owners PVC trim more and more with Azek as the leading choice. Azek is a very good product that is impervious to moisture and insects but it is more expensive. To keep the additional cost of the trim material in the project budget, some contractors are "selling" homeowners on the idea you don't have to paint azek. Homeowners appreciate saving the expense on paint, but are often suprised a couple of years later when there home looks like it needs to be painted. Azek doesn't have a finish and that leaves the material subject to dirt, smudges, hand prints, mold, and mildew. Many contractors install trim only and don't fill the nail holes or clean the trim when finished. You must use filler, caulk, and glue specified by Azek. Properly prepared and painted trim with even brush stokes gives the appearance of finely painted wood. A properly painted finish will last for years protecting the substrate from mold, mildew, and the uv rays from the sun. 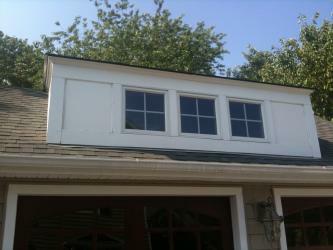 • AZEK Trim does not require paint for protection, but accepts and holds paint very well. • If you choose to paint use a 100% acrylic latex paint with colors having a Light Reflective Value (LRV) of 55 or higher. • For darker colors (LRV of 54 or lower), paints specifically designed for use on vinyl/pvc products such as, but not limited to, Sherwin-Williams VinylSafe™ coatings. These paints/coatings are designed to reduce excessive heat gain. • Follow the paint manufacturer’s recommendations for use and compatibility with AZEK Trim and Mouldings. • AZEK surfaces must be clean, dry, and void of any foreign material such as dirt, oil, grease or other contaminates that may come from normal handling, storage and/or installation prior to painting. • Moisture cycling is a main reason for paint failure on wood. Since AZEK material absorbs no moisture, paints last longer on AZEK products than it does on wood. • Since AZEK products have almost no moisture absorption, paints may take longer to cure on AZEK material than on wood. Generally paints on AZEK products will be dry to the touch quickly, but may take up to 30 days to fully cure depending on the humidity and temperature. For more information contact Harbor Painting. Above is a photo of Azek installed in 2008 and has not been painted. There are rusty nail holes, dirt blemishes, and settling. © 2015 harborpaints.com. All right reserved.